The text can be customized to suit your needs. A great gift idea. Durable and lasts for many years. Soft and fluffy especially after several washes. This listing is for one personalized embroidered nursery themed towel. The towel will be embroidered with three colorful love shape designs. The text can be customized to suit your needs. Please type the text correctly while checkout. Suitable for your kids or as a gift for your niece. A great gift idea for her birthday or even as a daily nursery towels. Get it for kids going to transit after school. A brilliant way to protect hygiene and avoid towel lost or misused. The thread used is polyester and is stitched in a fill pattern to withstand multiple washes. All of our work is done in a smoke-free area. We might change the thread color to suit the fabric/ material colors. Super absorbent towel. Easy care. Machine washable. Made from 100% cotton. Durable and lasts for many years. Wash dark color and white color separately. Color tone of actual products may slightly differ from those shown due to photographic lighting sources or your monitor settings. This product is made to order. Please allow 48 hours prior to shipment after payment is received. Since this is a custom order, DELIVERY might take 5-10 days from the payment (for order within Malaysia). However, for peak season and bulk order, more time is needed. Price inclusive of towel and embroidery. Order multiples to save more. Your whole family or team can have the same towel with your personalized design or team logo. Looking for something different? Perhaps we can help. Want to create your own personalizations? Let us know exactly what you want. We will create a draft image for your approval so we know we've got everything just right. We are happy to create a dedicated product for you as necessary if you require something different to the design shown! 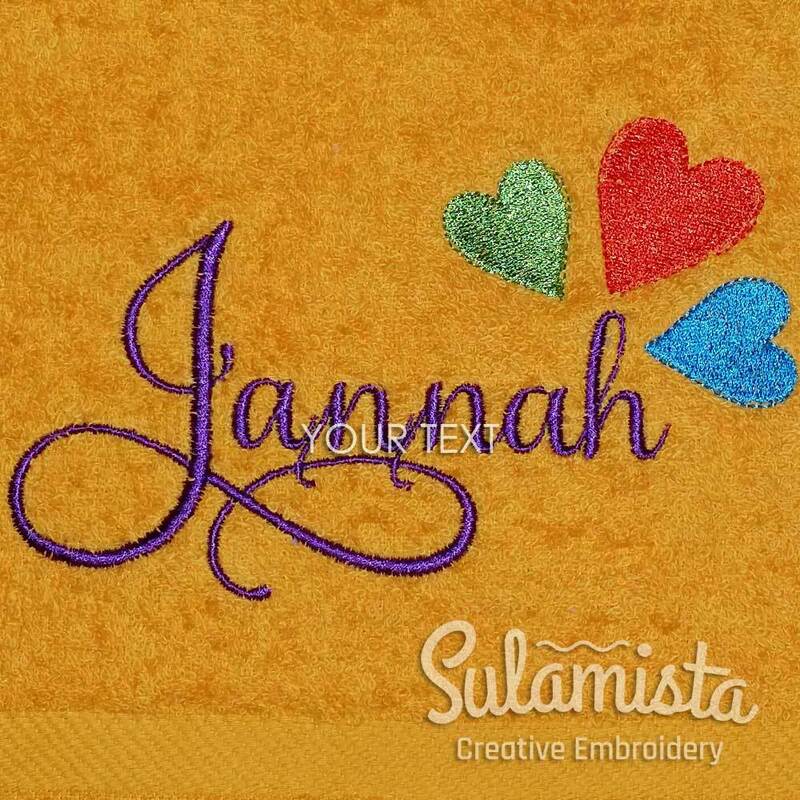 1 x towel size 25 inches x 50 inches embroidered with the design and personalized text.